In the run-up to this weekend’s GottaCon convention, I’ve finally gotten around to finishing the patrol markers I need to properly run Chain of Command-powered Russian Civil War games. I’d done status markers back in January, and now I’ve got a set of the Patrol and Jump Off Point markers you need for each side in Chain of Command. 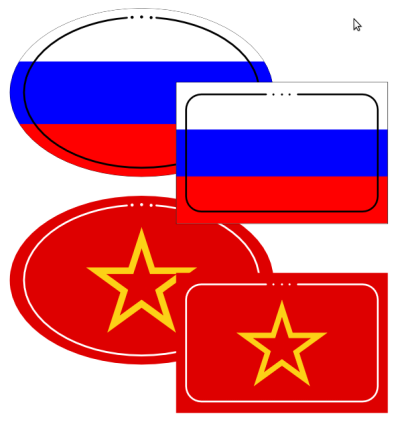 Imperial Russia, White Russian, Red Russian and German markers – see below for PDF link. Even better, I’ve done up German and Imperial Russian markers as well as White Russian and Red (Bolshevik) markers, so Eastern Front World War One is covered as well as the RCW. 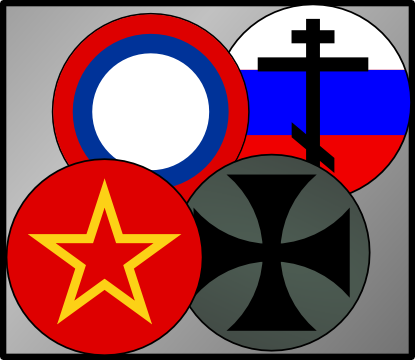 The Russian markers are based on the roundel used by the Imperial Air Force; the White marker is the Russian tricolour defaced with an Orthodox cross; the Reds get a yellow star on red background; and the Germans get the classic cross on a feldgrau background. Note that I included the previously-released CoC tactical markers as well, just to put the complete set of markers into one PDF. Permission is granted to print & copy this file for personal use only. Chain of Command is © TooFatLardies, obviously. Enjoy the markers! Feedback, suggestions or corrections in the comments below, please! Let me know if you actually use these things! Recently we’ve tried out TooFatLardie‘s Chain of Command/Through the Mud & the Blood hybrid rules with my Russian Civil War figures, and found them good, although with a bit of a learning curve. Chain has a few persistent conditions or stances that can apply to troops for multiple Phases, either voluntarily (Overwatch, the Tactical stance and some others) or involuntarily (Pinned and Broken, mostly). There are Chain markers available for download over on the TFL Yahoo Files site but they’re WW2-specific (Allied vs German) and I also wanted markers with a bit of a period feel that matched a set of status markers I did a while back for M&B games and some of the other graphical stuff I’ve produced over the years. So I did what I usually do, which is break out Inkscape, pour myself a drink, and spend an hour or two noodling away. The resulting PDF has a full set of standard markers for Chain games, with or without a WW1-flavoured M&B infusion, and might also be of interest to anyone using Chain for Very British Civil War alternate-1930s games. They’re colourful, large enough to handle, but not large enough (I think, anyway) to really disrupt the game visually. Both PDFs are single pages and tiny, 9.4Kb each. Permission is granted to copy or print these files for personal use only. I’m working up a batch of Patrol & Jump-off Point markers for Chain/M&B World War One and Russian Civil War action, planning on a multi-page PDF with markers for all of the major combatants. That should be out soon, hopefully next week. 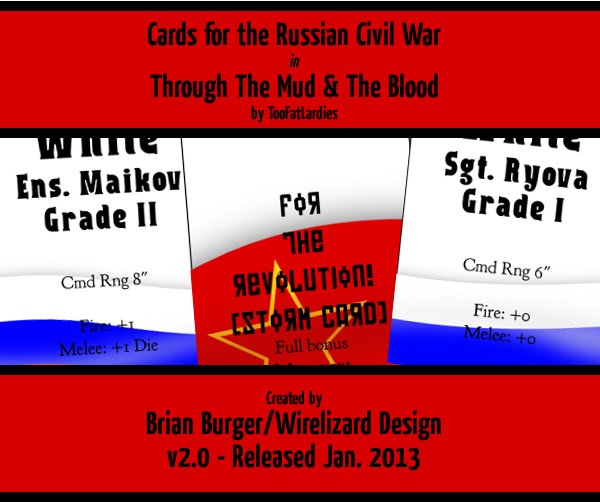 As I mentioned a few weeks ago, I’ve been rebuilding the entire deck of cards needed for Through the Mud & the Blood-powered Russian Civil War large skirmishes. I first made these cards back in November 2011, and after a year of use, we realized we’d wound up scribbling extra notes and other edits all over the cards we used, so I sat down and rebuilt the entire deck to incorporate the changes and edits we’d made while using the cards. There are four pages for Reds and four for Whites, with ten Big Man cards per side, ten Command Initiative cards, a full set of the basic “National Characteristic” cards as laid out in the main M&B rules, and ten more Support or blank cards so you can customize your deck and add scenario-specific cards. The front page also has two Snifter and one Blank card per the main M&B rules, so one printing of all nine pages should give you everything you need for quite large M&B games. Feedback in the comments, if you’re having problems, find a typo, or have ideas for the next edition of these cards! Because I happen to have a stockpile of them around the place, several years ago I started using pre-punched Avery business card sheets as gaming cards – Encounter Cards and vehicle cards in .45 Adventure, stats sheets for minor characters, more recently the Russian Civil War initiative cards for Mud & Blood. Even if you haven’t got pre-punched sheets around, the 2×3.5″ size is easy to use and handle printed onto ordinary cardstock and cut out. 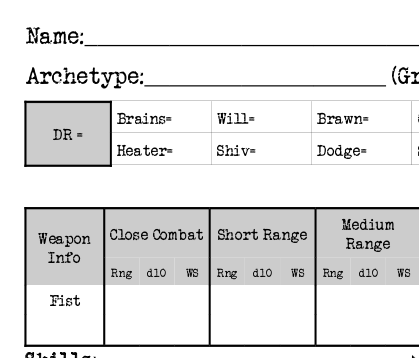 There is of course a Microsoft Word template available right off Avery’s own website but I created my own templates from scratch in Inkscape, first because Word is a lousy program for actual graphical work, and secondly because the Avery templates are set up with vertical (portrait) orientation of the sheets, while for most gaming cards having a landscape setup makes more sense. Accordingly, I kicked Inkscape to life, took some measurements from the Avery sheets and from their template and created a new template with the cards set up on a landscape (horizontal) sheet, which makes laying the cards out like small playing cards much easier. If you’re not sure which version to use, grab the PNG version, any modern graphics program should read PNG. Most should also be able to import PDF, which might get you a more accurate template. 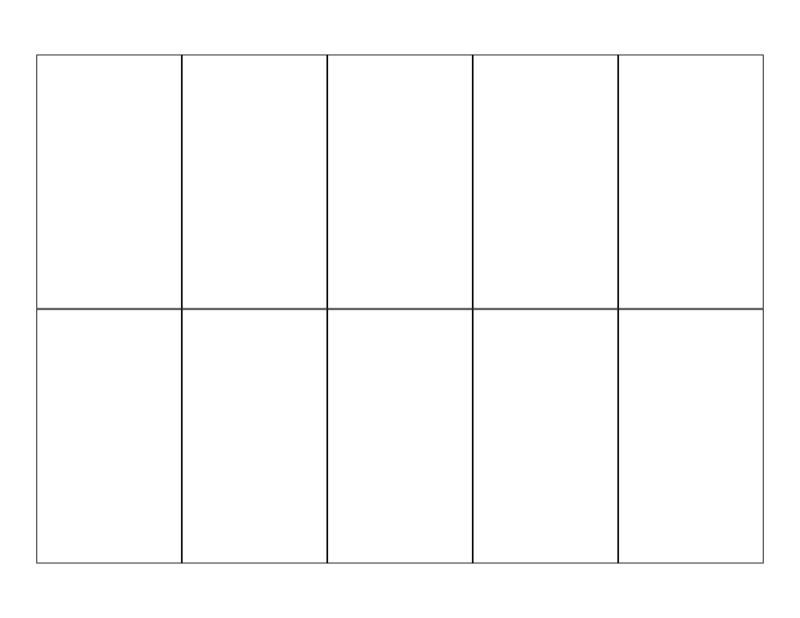 To the extent possible under law, Brian Burger/Wirelizard Design has waived all copyright and related or neighboring rights to Card Template Blanks (various file formats). This work is published from: Canada. The little grey block basically means that whoever downloads these can do whatever they like with them, including use them in commercial products. Go nuts. And if you’re from that rather large part of the word that doesn’t use Letter-size paper, sorry, but you’re going to have to come up with your own templates! I have managed to sort out the technical difficulties, and the RCW Cards are now released. Check out the RCW Cards Released post for more information. A number of the TooFatLardies games, including Through The Mud And The Blood, feature “Blinds” — markers used on the table at the start of the game to disguise the exact location and composition of your force and introduce some fog-of-war elements with a minimum of bookkeeping. Richard of TFL recently put out a PDF with a couple of generic blind markers to support his recently released I Ain’t Been Shot Mum, 3rd Edition WW2 rules — they’re on the TFL Yahoo Group, assuming you’re a member. They’re rather elegant oval markers, designed to print about 6″ wide and 4″ deep.